This audition has past. If you are interested in future auditions, send your resume and sample videos to audition@ILoveDRIP.com. Several of the top modern and contemporary dance companies in Central Florida are coming together to hold the inaugural United Dance Audition in Orlando. This is an opportunity for modern/contemporary dancers to be seen by ELEVEN dance companies at ONE audition! 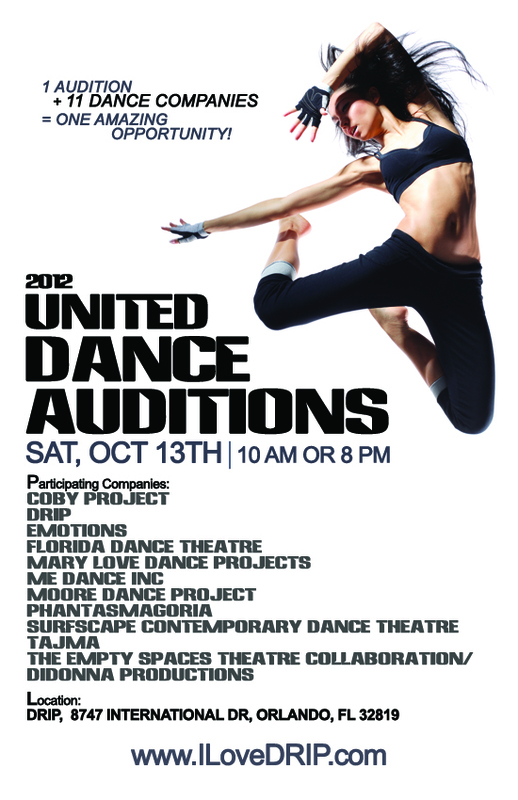 The United Dance Audition will be held on Saturday, October 13 at DRIP. Two audition times are available, 10 am and 8 pm. Dancers should bring a headshot and resume and will be asked to learn and perform short choreographed phrases in small groups, as well as improv. Dancers may want to bring jazz shoes and sneakers, as they will be auditioning on a concrete floor. Dancers must be 18 years or older to audition. RSVP’s are not necessary, but dancers with questions can call 347-855-3747 or email Auditions@ILoveDRIP.com. DRIP's New Show Opens on International Drive! Be the first to know about shows & special events!